Your gatekeeper, also known as life guide, spirit guide, or doorkeeper, is the guide that is with you from birth until your transition to spirit. 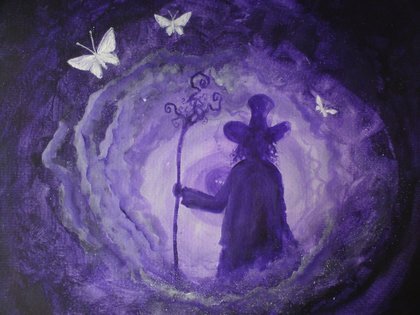 The gatekeeper is your overall protector, and watches over the other guides and the spirits who wish to communicate with you, they are always there to lend guidance and help in any way they can. While some guides change periodically through your life, the gatekeeper is a constant companion. Get into a comfortable meditative position, begin breathing through your nose and out your mouth, clear your mind, once you feel ready, do the meditation below. 1. Take a few deep breaths and relax your body. Bring your awareness to the top of your body, starting at your head, and give yourself permission to relax. As you breathe, release any tension. Move from your head and neck into your shoulders and arms. Relax and feel all the tension melt away. Relax your chest and back. Feel waves of relaxation move down your spine. Relax your abdomen, lower back, and hips. Relax your legs, down to your ankles and feet. Feel the waves of relaxation sweep all that doesn’t serve your highest good out through your fingers and toes, grounding and neutralizing this unwanted energy into the Earth, transforming it like the earth turns fallen leaves into new soil. 2. Relax your mind. Release any unwanted thoughts and worries as you exhale. Relax your heart and open it to the love of the Goddess and God. Relax your soul, and follow your inner light, guidance and protection. 3. Visualize a giant screen before you, like a blackboard or a movie screen. This is the screen of your mind, or what is called your mind’s eye. Whenever you visualize or recall anything, or remember a person’s face or anything else, you project it onto this screen. Anything you desire will appear on the screen. 5. You are at your ritual consciousness. Everything done at this level is for your highest good, harming none. 6. You are now counting down to a deeper, more focused meditative state. Count backwards from thirteen to one, but do not visualize the numbers this time. Let the numbers gently take you down: 13, 12, 11, 10, 9, 8, 7, 6, 5, 4, 3, 2, 1 You are now at your deepest meditative state, your magickal mindset, in complete control of your magickal abilities. Say to yourself: I ask the Goddess and God to protect and guide me in this meditation. You are walking along a country lane, the sun is shining down and you feel warm and happy. There's an open field on your left and a large woods on your right. You can hear birds singing in the trees and a gentle breeze wafts against your face. You see ahead of you a small path that leads to the right, into the woods. Take that path. it leads at a slight downward slope, winding in amongst the trees. You can see the sun up above, shining down through the branches and creating a wonderfully warm and comforting environment. Small animals such as squirrels, rabbits, and chipmunks peek out at you as you go on your way. The angle of a descent gradually steepens, and you come to a cliff edge. You are not very high up; in fact you are no higher than the tops of the trees on the ground below the cliff. You see that someone has cut large steps into the face of the cliff and these lead downward to the wooded ground below. You go down these steps. It's an easy descent and you feel safe and secure as you go down. At the bottom you cross the short expanse of grass to go, once more, in amongst the trees. As you move on, you become aware of the sound of a babbling brook. The sound gets louder as you approach it. As the path makes a turn to the right, you see the brook ahead of you; its busy waters rushing over and around small and large stones. The path you are on follows along the side of the brook and you walk along it, noticing how the water swirls and eddies as it goes on its journey. Other small streams come in to join it and gradually it swells until it becomes a small river. As you walk on, beside it, you enjoy occasional glimpses of fish in the river, and of a duck or two that lands on the water then takes off again. A large tree has fallen and stretches across the river, its upper branches on the far bank. Take the opportunity to cross over; jump up onto the tree trunk and walk across. You feel firm and secure knowing you will not slip or fall. On the other side, you notice a large number of wild flowers growing in amongst the trees and underbrush. There is another path – you were obviously not the first to cross by the fallen tree. Follow along the path and notice the flowers and, again, the animals and birds. Ahead of you the trees start to thin and you come out of the woods into a field. Stop and stand with the wood behind you. Fields stretch away to the horizon ahead of you. Off to the left you can make out high mountains, and to the right you cans see the wood curving around and off with more fields beyond. But in front of you, in the middle of the field at whose edge you stand, there is a circle of standing stones. Each stone stands nine to ten feet tall. There are a number of them forming the circle;…. great granite monoliths. They look older than time; as if they have stood there for century upon century. Count how many there are. Move forward into the ring. You feel happy, warm, and comforted, as if the stones are guardians surrounding you and keeping out all of negativity. Walk to the very center of the circle they form and sit down on the grass. You are aware of the warmth of the sun and sound of the birds. Again you feel that gentle breeze on your cheeks. Close your eyes for a moment and breathe deeply. Breathe in all the wonderful, positive energies of this sacred place. As you sit there quietly, you become aware of another person joining you. Keep your eyes closed. This person has come up from behind you and now moves around to face you. It's a good presence, a comforting one. It is your personal guide. It is the doorkeeper who has watched over your progress for many years. Don't yet open your eyes, but stand up, reach out your hands and take those that are offered. Feel them. Feel the love and warmth that comes from them. Now open your eyes and see your guide. Is it a man or woman? Young or old? What is he or she wearing? Notice everything about this guide. Ask by what name you should call him or her, and greet him or her appropriately. Ask if they have a special message for you. Know that this stone circle is your “special place”. You can come here at any time, knowing that you can meet with your guide; or anyone else you wish, and be perfectly safe and secure. You can ask all you wish to know of your guide. No one else can come here without your permission. When you have finished speaking to your guide, bid him or her goodbye, and say that you will meet them again very soon. Then turn and walk out of the circle back towards the woods. Retrace your steps, going back to the river and across the fallen tree trunk. Follow back along the path until it parts company with the stream. Go up the steps in the cliff and head out of the wood again, back on to the country road. Know that you have had a unique journey, but that you can repeat it any time you wish. It is now time to return. Begin to count from 1 to 13, you will gradually come back from your deepest meditative state. Begin to count from 1 – 12 with each number feel yourself becoming more and more aware of yourself and your surroundings. When you reach number 12 you will be fully present and aware.